Located on the Garhwal hills and on the banks of the River Alakananda, the Badarinath Temple is situated between the two mountains of Nara and Narayana (named after the two great saints who meditated here). The Badarinath Temple is also considered as the most important of the Char Dhams and is also revered as one of the 108 Divya Desams. The temple is primarily dedicated to Lord Vishnu. The origins of the temple may be traced back to the period of the Mahabharata. Opposite the Badarinath Temple are the Vyas Temple (Ved Vyas is believed to have written the Mahabharata at this very location) and the Ganesh Guha (this is the place where Lord Ganesha helped Ved Vyasa to write the Mahabharata). The River Saraswati and the Bhima’s Rock are also visible in the nearby area. The architecture of the temple seems to have been directly inspired from the Buddhist style of architecture. The scenic beauty of the area is such that it is often said that even the Gods would love to reside in this place. The Badarinath Temple is believed to have been in existence much before the Mahabharata. Even the Vedas explicitly refer to the Badarinath Temple. After the advent of Buddhism in the region, the temple was completely destroyed and the idol was thrown in the River Alakananda. The idol was later retrieved by Sri Adi Shankaracharya, who kept it in the Garud Gupha (where it was kept for almost seven centuries). Later Varadarajacharya insisted the ruler of the region to build a temple. This is how the current temple came into existence. The gold canopy in the temple was later provided by Rani Ahalyabai Holkar. o Goddess Ganga, when requested to descend upon earth to save humanity from suffering, was divided into twelve holy channels, since the earth was unable to bear the force of its descent. One of these holy channels is the River Alakananda. o As per another legend, Lord Vishnu was mesmerized by the beauty of the area and wanted to unseat Lord Shiva (who was then occupying the area). Lord Vishnu disguised as a beautiful child, tried to disturb the meditation of Lord Shiva through constant wailing. The disturbed and angered Lord Shiva left the place for Kedarnath and thereby left the place to be occupied by Lord Vishnu. Some traces of Lord Shiva are still evident in and around the area such as the gigantic tree that served Lord Shiva and the Badari (a kind of berry, of which Lord Shiva was very fond). It is believed that Adi Shankaracharya, a reincarnation of Lord Shiva, was once enthused by the divine breeze of Sushmaand Gandhmadan Mountain and immediately started reciting the Ashtapadi. After a few days, he embarked upon the journey to search the idol of Lord Badarinath, on the banks of the River Alakananda. He dived into the river and after his third effort, a divine voice revealed that the object in his hand was the idol of Lord Badarinath. Thus Sri Adi Shankaracharya consecrated the Badarinath Temple and the practices established by him are followed till date. The architecture of the Badarinath Temple is an excellent fusion of religious and structural brilliance. The rich history and cultural heritage associated with the temple, further enhances the significance of the temple. The natural scenic beauty of the area attracts a huge number of tourist and devotees alike. The fairs organized at Jauljibi, Thal, Bageshwar, Dwarahat, Syalde and Devidhura also contributes to the cultural and trade potential of the region. o Mata Murti ka Mela- The grand fair is organized to worship the mother of Lord Badarinath and is generally organized in the month of September. 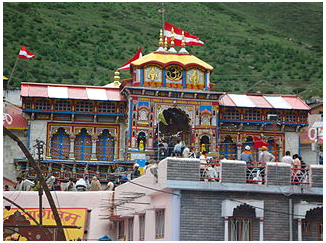 o Badari Kedar Festival- This festival is celebrated in the Badarinath Temple and the Kedarnath Temple in the month of June. The Badarinath Temple is opened for worship for only six months i.e. from the month of May to the beginning of November. The temple is closed during the winter months, as the temple is covered with a thick blanket of snow during this period. It is also believed that during the winter months Sage Narada worships Lord Badarinath. During the closure period, the idol of Uddhava is carried to Pandukeshwar and it is housed and worshipped there. The Akhanda Deep is lighted when the temple is about to be closed and it stays miraculously lighted when the temple is reopened. The daily ceremonies of the temple begin at around 6:30 a.m. in the morning and are completed by 9:30 p.m. The pundits associated with the Badarinath Temple are generally known as Rawal. The Rawals are Namboodiri Brahmins from Kerala and are jointly appointed by the Badarinath Temple committee and by the Maharaja of Tehri Garhwal. The Rawals are usually well versed in Sanskrit and Puja ceremonies.